Hundreds of studies over the last two decades are finding “fragrance” in beauty products and household cleaners are just as bad or worse for our health than secondhand smoke. Is it time for fragrance-free workplaces, hotel rooms and sections in restaurants? When a few people began complaining about second-hand smoke in the 1960s — a time when nearly half of American adults smoked — the general public and businesses considered it a fringe movement not likely to go anywhere. But by 1985, smoke-free city ordinances began popping up, and by 2007, 30 states had passed comprehensive smoke-free laws. “We propose that fragrance is following the same trajectory,” write the lead authors of the paper, Loyola University Maryland management professor Christy Devader and University of Maryland nursing professor Paxson Barker. The average U.S. consumer today is as uneducated about the dangers of synthetic fragrances as the average American was to the dangers of second-hand smoke in the 1960s, Devader and Barker argue. Manufacturers of beauty and cleaning products don’t have to disclose the hundreds of potential chemicals that could be used to make their fragrance, because they are considered “trade secrets” by the FDA. Around 90% of the chemicals included in the label “fragrance” are synthesized from petroleum or coal tar. Toxic chemicals commonly found in products with “fragrance” on the ingredients list include acetone, phenol, toluene, benzyl acetate, limonene and formaldehyde. A 2017 Australian study found synthetic fragrances trigger respiratory problems such as coughing and shortness of breath in 1 out of 5 people and migraines in 1 out of 10. Another 10 percent experience rashes or other skin problems when exposed, and 8 percent said they’ve missed work or lost a job due to fragrance-related illness in the workplace. A 2016 study found 1/3 of Americans report adverse health effects when exposed to artificial fragrances. Breathing problems such as hay fever and asthma, found in 15-20% of North Americans, are also exacerbated by synthetic fragrance. People with multiple chemical sensitivity can have even more severe reactions, making it difficult for them to hold a job or even go out in public.What makes fragrance even more insidious than secondhand smoke is the difficulty in detecting it. If you’re sensitive to cigarettes, you can walk in the other direction when you see a cloud of smoke or someone holding a cigarette on the street. With fragrance, it’s hard to identify where it might be coming from until it’s too late. Some fragrance products are designed to be slow release, so people wearing them continue to emit a “bubble” of toxins for hours to come. “When ignorance is replaced with knowledge, a large segment of the population will respond with a demand for clean and safe air in the workplace,” Devader and Barker write. After many of the public and private organizations in Nova Scotia went fragrance-free, perfume sales dropped over 30 percent. Fragrances cost employers billions of dollars a year in lost productivity, sick time and lawsuits, the researchers note. Until laws are passed, they recommend business owners posts signs in bathrooms and around buildings requesting employees not wear fragrances to work. Concerned consumers should look for products labeled “fragrance-free” or that simply don’t list “fragrance” on the ingredients list, as products labeled “unscented” can still contain artificial fragrances used to mask the smell of other noxious chemicals. As for household cleaners, baking soda and vinegar work better than just about any product on the market, are cheaper and non-toxic. I’ve been saying this for years….had to leave my job because of it….with no acknowledgement of the circumstances…..you are met with criticism and disregard….I hope someday soon this attitude, armed with knowledge changes this for future generations. I kept pneumonia all the time at work and they would not believe it was chemicals. Although before I came there they had one guy secured in a room because of his chemical allergy. I was told there was nothing I or they could do…”it was their right to wear it”. You don’t get pneumonia from chemicals, that’s not how it works. Maybe you had a bad reaction but it wasn’t pneumonia. Chronic inflammation can contribute to pneumonia…. I too had to leave my job because if health effects due to a co worker leaving her smell on everything she touched, customers covered in high quantities of scent and bathroom chemicals that nearly put me in hospital, but that was of no concern to the manager! He thought it was all in my mind! There were other issues too, but this was bad! What’s with … all the …. dots? National Institute of Occupation Safety and Health data, US Environmental Protection Agency data, Substance Control Act of 1976 and Cancer Prevention Coalition data. The blue words in the article are links to the sources. Yet with such scientific articles, traditional citation would be nice. Sadly, citation has gone the way of vinyl LP’s, landlines, and non-computerized autos. this is ridiculous. Not ALL fragrances are hazardous. Not ALL fragrances are harmful. Many as we all know are healing and soothing, made from natural oils. This is a Puritan backlash. Believe me, I understand, because I have asthma, and yes those commercial fragrances are obnoxious. But to rule out ALL scent.. Oy. Let’s just rid the world of all sensory delights right now and be done with it. Those natural oils you so blissfully call healing and soothing can put me in the hospital as fast or faster than lysol – it really depends on who you are and what you react to what will put you into anaphylaxis. I have had more than my share of living oils pedlers try to convince me that all I have to do is fight through the blinding discomfort of not being able to breath and their fabulous product will cure all that ails me. Sheesh – give me a break -I prefer that epi pens not become my best friends. EXACTLY. My mask and my epi-pen. They go with me everywhere. Oils are a trigger for me, as well. So, please don’t think that just because it sounds natural — or even may be natural — that it can’t be a trigger for us. I also have food/beverage triggers. There are many others like me (even worse off) in this world. WE DO MATTER!!! Please keep your fragrances away from public exposure. Not all things that emit a fragrance fall into the category of harmful, but more than enough do. Maybe for the sake of the greater good you could do without a room smelling like vanilla vomited all over some flowers. I’m fairly certain Becky at work could also stand to not smell like a baby stripper when she arrives at work to impress Chad in sales. All of these things give me migraines, which create delays at work. Scented candles, perfumes, and essential oils render me useless, curled up in the fetal position in with a cold mask over my eyes praying I don’t throw up this time. Consider the effect on others, please. Absolutely right! Some of my coworkers like to use “essential oils”… the scent is so strong I feel like someone is punching me in the face all day. Thankfully, my workplace HAS a frangrance free policy, and management enforces it…. though I had to demand that they enforce it. My favorites are the smokers who come.into.work in the mornings after thenhave hosed themselves down with perfumes because they changed smoked the whole way into work. Synthetic fragrances are different that essential oils….the topic is about synthetic fragrances and they are the only scents that affect people adversely. This article is talking about synthetic fragrances but essential oils will most certainly make people I’ll! I tried them for awhile until I started getting migraines while using them. I had to get almost all of them out of my house to stop the migraines. Then maybe you weren’t using 100% pure oils. I get migraines from chemical scents, have for years but I use YL essential oils to help get rid of them! They work for me!!! Once people become sensitized to synthetic fragrance the next step can be essential oils as the brain starts to kindle. It’s not a Puritan backlash when a fragrance (whether natural or not) makes you cough so much you vomit or gives you a migraine. The sensory delights I enjoy will still be there after all the added fragrances go way. And we’ll be able to enjoy them when we quit bombarding ourselves with unnecessary fragrances. They are talking about chemicals not natural scents .. did you read the article ??? I react to MANY natural scents. Just about any floral scent, be it synthetic or natural, will cause me to begin coughing; and too much will cause my asthma to flare wildly. Yes! Young Living Essential Oils are pure plant distillations, have nothing in them to be allergic to or harmed by. Diffusing them in your home or office purifies the air and promotes health. My MIL Diffused Lavender essential oil, and put drops on my daughter’s feet. She broke out in hives everywhere her skirt n was exposed and became sick. You are wrong. Now, every time she comes into contact with Lavender, she has a terrible reaction. Mold. Unless the mountain mint family is grown in sunny, dry areas, and with the geoengineering in our skies, it is even making plantlife we eat “sugary”, the overcast effect is so bad. Omg people stop ranting about how’s purifying essential oils are, they as well make me gag and wretch and cough when exposed, some people are severely allergic to strong odours. Period. Like myself. Something that developed at 40 after being exposed to sub par air at my workplace. I agree with you on this, except that my sister and mom with allergies would not be able to use natural oils. However, I do agree that this is excessive to ban all fragrances. It’s easy enough to stand away from someone with fragrances. If it’s an issue with a coworker and an office, approaching it the right way should be able to be resolved on a case by case basis. It’s actually not that easy to stand away from them. The chemical components of fragrance disperse easily through the air, going through ventilation systems and leaving chemical trails were these people walk. I’ve had daily intractable migraines for 3 years and I’ve had to leave 2 jobs and temporarily quit grad school because of the fragrance issue. I worked in an office with a lady who smelled like gummy bears.The scent was very faint to everyone else around me, yet I was there being overpowered by fragrance. Migraines, fibromyalgia and other conditions can cause you to be far more sensitive to smells than anyone else around you. It makes certain things like taking the train almost impossible due to peoples body odor and heavy chemical odors. they do this to be fair, n blau, and to avoid having to research each person’s perfume. every BODY gets to be loved for themselves. I too use natural” perfumes, not all are ethical, even if it is lavender it can come from another country that just says it is organic and the USDA checks the “organic” box and even it I grew it in my yard some people give me some from theirs and it is moldy. I wear a lovely smelling scent it is auric egytian goddess but it lasts a long time…an indicator that it is artificial, not that lavender can’t but as I put it on my wrist I ask myself is this a timebomb? will I get breast cancer from this. even bronner’s soap, it is sometimes overpowering, I have mixed it with the unscented baby soap. I do not think they make unscented aftershave for men do they? and some natural deodorants some of the ingredients to make it strictly deodorant actually have an ingrained “scent”, such as a type of lichen, commonly used in perfumes. It may be the lichen organism itself. Rona, I am so sorry to hear of what you are going through. I apologize beforehand if I say anything insensitive…I was concerned with indoor air quality and I stumbled upon Dr. Bill Wolverton. He was the Nasa scientist in charge of the biodome project. He put out a book on all various house plants and the chems they take out of the air. He is also the inventor of the plant-air planters that take in air run it through gravel and plant roots and blow purified air back out. I have two. they are nice folks by the way too. the book is “how to grow fresh air” by dr bw. another fabulous book is “Living green” by greg Horn, former CEO of GNC stores. He got a new office interior and it just tore up his life until he found out what it was. rashes, migraines etc. It is a fabulous book on multiple chemical sensitivities. the biggest take away for me was EVERYBODY IS A TICKING TIME BOMB IN THE ENVIRONMENT AND NON-CONCERN OF THE RELEASE IN CHEMICALS IN EVERYTHING times that we live in. It is a matter of when rather than if somebody will get ill from scents, smoke which is just an indicator that they can put a actual finger on that they are bombarded from every other direction too. e.g. I buy solid wood furniture at thrift stores if i have to, rather than laminated particle board furniture as the resin glues are noxious. there are lots of sources of contaminants that you cannot smell and he lays it all on the table and the second half of the book is a guide to clean up your personal space and products to make or use be wary of method or ecover. It is pitiful to say and dears it makes me weep…it is a risk I would say for sensitive folks like you to even have seafood…our oceans have become chemical toxic cesspools. Our skies have the geoengineering in them, a spray of many different mixes but the main ones are nano sized pure aluminum and sulfor dioxide? we are run by an insane asyllum as dane wigington of geoengineeringwatch says. vaccines are loaded too and have glyphosate in them, take medications? many are gmos bred to be toxic crops. go to thrift stores and buy organic cotton or clothes washed many times already and already cost the earth. check these things out. Namaste sweet souls. This is NOT a “new” problem by any stretch of the imagination! We’ve been suffering the stench of heavy-handed application of women’s perfumes — and men’s colognes – for decades. Still can’t walk through any public place without at least one or two people walking buy who trail their stench after them. Some people’s perfume or cologne actually gets to the room before THEY do! It is awful walking through a mall and smelling bath & body works. They should have their own locations out of malls. I agree, I get sick just walking by that store! I have to go to the other side of the walkway and pray there is nothing over there. I no longer go into the large drug stores, like Shoppers Drug Mart and Pharmasave, because they have the perfumed products at the entrance!! I actually had a gal who was spraying customers with perfume chase me down the aisle because I refused to let her spray me!!!! Report her. Many states have laws against that due to customer law suits after asthma attacks. Spraying people without permission at the front of a store was common before the late 80’s. At the very least, her not accepting your refusal is harassment. I’m not sure how A&F gets away with automated sprayers. Trust me if someone tried that with me I would have taken that bottle from her and emptied it over her! That is so crazy and I my country if you do that better be prepared to get knocked down or even out.. It’s a physical assault since there is no consent. Frances that is assault. Report her if it isnt too far in the past. Crazy woman. I have difficulty going in some stores because they put all the perfume etc at the entrance. This is definitely a problem and one that is so easy to solve. It causes me headaches and I am perpetually having to cover my nose and mouth as the stench of these so-called perfumes and fragrances is repulsive. People who wear them seem to be unaware of how bad they smell. I’ve even had someone tell me that they have no sense of smell – so why wear it then? Do they honestly think other people enjoy having to breathe their foul stuff? n blau – Those ‘natural oils’ give me a migraine, starting within a few minutes of being in their presence – that’s 3 -4 days of lying in bed, in a dark room, with a hot wash cloth on my face, after finding a spot, where the throbbing, constant pain is the least…. So, you have asthma do you????? AND you like essential, natural oils, do you???? Give me a break!!!!! Some people are their own worst enemies…. I avoid scents, like the plague and have not had a migraine, for many years….I use unscented everything & vinegar for cleaning – no bleach, etc…thankful my friends understand & don’t use scents, or light candles, when they know they’ll be with me. I avoid many stores that I would love to shop in, if I stand at the door & smell scents – I don’t want to suffer…. Can someone who uses alternative options for these everyday products advise what to use vs.these toxic chemicals. I have already changed from cleaning products to just vinegar and water. Thank you! I make orgabic natural bath and body products with absolutely zero synthetic fragrances. Natural essential oils would be my guess. But even those need to be used in small very amounts. This is dumb! Certainly there are some people that are affected by scents but for the small group that is I see no reason to control the masses. Tobacco and cannabis is different but look at where this country is going with the legalization of that crap! Focus on eliminating cannabis smoke instead of complaining about cologne! I am chemically sensitive and although I do not like the smell of pot I would take that any day over the chemicals used in the fragrance of laundry soaps, perfumes, deodorants, air fresheners, etc. There can be 300 chemicals in ONE single fragrance and because they are considered trade secrets they do not need to be labeled and many of these substances are dangerous. It is not smell but the chemicals that make us ill!!! I agree. There are 2 sides. Certainly people who wear fragrance need to be cautious in their applications and even forgo them in close quarters (airplanes) or on the job (hospital). But those who are sensitive can not control everything. 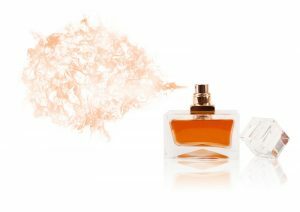 Even if a person is not extremely sensitive to fragrances, and may actually enjoy them, one of the main points in the article is that synthetic fragrances are harmful to everyone. The number of people who have athsmatic are rising in part to these triggers. Point is that loss of human potential and productivity, not to mention human suffering, is a gigantic price to pay for them and for society in general,for the sake of smelling pretty. I had to leave my job with a major cosmetics company due to the fragrance people spraying people in our area. Started falling over with buzzing ears! Recently I had a lung removed due to cancer. Thank you for posting this plea to the world . Great article. Until the last line. You do realize that baking soda and vinegar make water, right? Both great and useful products on their own, but together they’re useless. castille soap perhaps as it’s unscented and made of olive oil ? .. or the old fashioned yellow soap that grandma used to use in a little wire basket that was whisked around in the water to create bubbles. A drop of spearmint or lemon or sweet orange essential oil in the bottle of castille soap is nice too, if you’re not sensitive to that. I haven’t used any fragrance products whatsoever in 10 years bc of my Children’s sensitive skin, allergies & my headaches. It can be done. After much research I began using a very high quality brand of essential oils recommended by my holistic physician & practitioners a year ago & now we no longer use synthetic OTC meds either—allergy symptoms are so much better. So please be careful, as most EOs (esp in stores & online) are synthetic or diluted), but please don’t rule out well-tested, high-quality EOs. When used properly, they can be safe & very effective. In fact I no longer suffer from migraines & these oils have been a blessing to my family’s health. I do not want this to be an ad for a brand, just want ppl to know there are safe oils out there. Please do your homework. It’s easy to look up the #1 essential oil brand in the US. (Hint: it’s the one that has co-impact sourcing & sources their plants where they grow indigenously & have 3rd party testing.) With our son’s nut allergy I absolutely must know ingredients & this is the only brand that provides the chemistry reports for every single bottle. Planet, fragrance free works for me…..even many of the “natural” cleaners have toxins….method and mrs meyers are two example of high priced “green washing” that contain harmful chemicals and strong fragrance. ECos brand dish soap (unscented) works well! Its not about controlling the masses, but having consideration for the health and well being of others. Continuing to use things such as toilet sprays or air fresheners in a place after someone has told you that it gives them a bad reaction is just rude. My daughter is sensitive to fragrances. But where are the fragrance free products? I use vinegar and baking soda as much as I can. But I still need to wash us and our clothes. My new low water washer is sensitive to what I use. I can’t find shampoo, body wash, toothpaste, deodorant that is fragrance free. Plus, there’s dish soap, dog shampoo, etc. I hate having more laws. But maybe if a few really large corporations went fragrance free, the makers of these products would feel it necessary to offer them without fragrance. Now if we could get rid of artificial flavors…..
Paula’s Choice will have shampoo, body wash and facial products, and makeup without fragrance. What people choose to do in their own homes is their personal choice. But public places – most especially enclosed spaces, and in particular, medical facilities – should not be using chemical ‘scents’ of any kind. These chemicals compromise the respiratory systems of patients in medical facilities, who already have health issues. What I find particularly caustic are the chemical spray atomizers that automatically spritz the air in bathrooms. These are not ‘air fresheners’, they are air poisoners. My skin literally burns and itches after being exposed, my nasal passages burn as if I inhaled acid and my throat is raw, but we don’t have much choice when we need to use the bathrooms. Recently I used a car service for a 2hr transportation home from the airport. Within minutes, I knew there was some type of chemical ‘air freshener’ in the car, but I couldn’t see one anywhere. My eyes were burning and the skin on my face began to itch. I started getting a headache. Very soon I was so congested that I couldn’t breathe through my nose and had to have the window open to get some fresh air. To make matters worse (and without our knowledge), the driver chose to take an alternative route that ended up adding another hour onto the 2hr trip. When I’m exposed to these types of chemical poisonings, my system tries to eliminate the toxins from my body as fast as possible, so I find myself having to urinate (full bladder) incredibly often – sometimes only minutes apart. This is not fun and to my dismay, I’ve had ‘accidents’ because of these exposures. I now wear a protective pad whenever I think I may be in this type of situation. Unfortunately, i don’t always know when that type of situation may occur. It could be as simple as using the bathroom at the doctor’s office, that starts the process. When I explained to the driver why we needed to make another bathroom stop, he apologized and opened the console compartment between the front seats and pulled out a scented oil diffuser. He offered to put it in the trunk – NO way!! I wasn’t going to have my cloth luggage and belongings absorb those chemicals! He eventually threw it into the garbage at one of the rest areas where we had to stop. I now make sure that car rental services do not use any scented anything’s in vehicles I will be in. Thank you so much for this article and summarizing the studies…..the dryer sheets have a wax base, so if you use a laundromat, the toxins are now on your fabrics, which by the way come with fabric finish, so almost all new clothing has toxins as well….certainly anything from a thrift store where they generally spray everything…..Now they are even putting Febreeze in/on garbage bags…..are we so afraid of our own body smells that we are willing to slowly die, and poison the planet, to not smell them? So when could people wear perfume? Where could they wear it? I think a ban towards the use of fossil fuels should be done first. 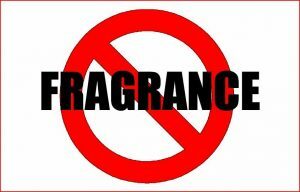 After all the carcinogens are banned, only then we can go after fragrances that irritate people’s respiratory systems. There need to be some common sense restrictions in workplaces. There is no reason to have all those scented sprays and plug-ins and sprays. There are ones that just neutralize the air without an obnoxious scent. Employess should be warned about their personal use of fragrance and face disciplinary action if they continue to choke everyone out with their clouds of perfume or cologne. It’s in my religion’s laws to perfume myself, so banning fragrance takes away from my religious rights. Besides that, as someone who is sensitive to cigarette smoke and someone who has been sensitive to some fragrances, it’s absolutely not the same thing. The smell doesn’t carry near as far, and it’s easy to step away from those people. In the case of a work environment that you are exposed to every day, most should be willing to work with you if you address it right. Furthermore, the health effects are no where near what they are from second hand smoke. The health concerns pointed out in the article from certain chemicals are at high, unsafe levels. There is an organization regulating most of the perfume companies to make sure allergens are limited and chemicals are at safe levels. Chemists are continually doing working to find safer alternatives to ingredients in perfumes. A lot of these changes have the effect of limiting the performance of perfumes as well, so they don’t last as long or carry as far, which will be better for you haters, but not so much for perfume lovers. To those of you above that have this issue, we need to create a private page on FB and get together. Ms. Marci, all I can say to you is I hope you never have to deal with this crap because we are not haters, we are just trying to live our lives and YES these fragrances do affect a lot of us. One lady at my last job wore so much perfume it literally blistered my face! She and another you could smell when you got out of your car outside if they had arrived prior to you! Body temps go up, headaches, being sick, throwing up, bloody nose, skin burning, all sorts of things happen with different items. I just love throwing up at work, it’s so fun!! You see I don’t have the option of quitting my job, not yet anyway – I’m 2 yrs from retirement and I pray every day that I make it and get to enjoy retirement for a few years. I have gotten lucky, this last 3 years I have worked with a group of folks that care. They purchased an air cleaner for my office and put a glass door on my office so I can close the door and keep the smells from the hall out. Folks still come in but my boss will let me close his door and he will open his windows immediately so the smell goes outside for the most part – Fragrance Free Fabreeze is my best friend, next to my fan and air cleaner! I have gotten lucky, my boss has to be the best person I have ever met in my life. He understands and works at educating others on my behalf. Compassion for others, that’s where it starts. I’m really happy for those that do not have to deal with this, I truly am jealous I’m not one of you. I would give about anything to not have to ask folks to not wear smelly stuff, or burn a candle if I’m coming over. I truly do know who my friends are because of this sensitivity issue! fabreeze is exactly that fabricated breeze. we may be sensitive to scents because of all the other chemicals we expose ourselves to. the fabreeze should be the first thing to go check out Living green by greg horn and my comment above. Exactly! Most people dont know about ifra! DRYER SHEETS ARE THE WORST OFFENDERS-KINDLY ADD TO YOUR LIST. THE …WORST!! People put that on their gym clothes and go into whole foods to get their nice healthy meal next, treat, reward…and leave bodies on the floor behind them. dont’ bother with clean food, dont’ take up the supply when you foolishly put that crp on your clothes; you wipe out the benefit of it ten fold. the most noxious, dangerous thing there is and people put blankets over their babies faces wreaking with that [ ] and wonder what is wrong with their child. and the goofs…they walk around with stuffed up noses telling you it is their “allergies”. LOL…and because they are stuffed up that can’t smell that [ ] and throw in ten sheets for added measure. I will bet people die in their house. their whole family is probably ill or at least has “allergies” if not out and out asthma. they probably use scented everything…candles that wreak of conventional scent, perfumes, hand cremes, shampoos, fab softener, dryersheets is it any wonder we are eating this crp in our seafood and the oceans are dying off? lol it is funny but it isn’t. who are these fools? they would never be my friends, I could not possibly be. I literally can smell dryer sheets on friends clothes when I hug them!! Outside walking past dryer vents, I smell the dryer sheets!! The cleaner I’ve made my world the more sensitive I’ve become to chemical scents. In “Living green” by greg Horn, he says that if you have MCS, do yourself the favor of checking out everything else in your home, even office. everybody is a timebomb waiting to go off. sensitivity to scents is just a symptom that you can put your finger (nose) on. that it is likely you have a house full of chemicals that you can’t smell and that is what the book is about. talks about the human body, the disease?/condition of MCS and how to help yourself. to comeplain about scents when you use toxins in your home or eat really bad conventional foods…conv. carrots are better than near plastic nacho “cheese” on toxic conv. corn chips (TOXIC, GMO, GLYPHOSATEY, PLUS) for instance. and of course organic is best. You need to examine all that you do. some things are beyond your control but making your own baking soda, vinegar cleaners are doable. there is such a thing as a toxic checklist for your home. Just like the dept of energy has an energy saving one. It may even be in his book but you can google and probably find it. try to get rid of plastics in your home-another thing that is every where try to put natural products instead. stainless steeel and glass in your kitchens…sorry, I wish I could help more but living green is in valuable. medications too… Maybe bashing these other industries too to clean up our oceans are near dead do not feel bad at all about demanding the sociopathic buffoons clean up EVERYTHING. BE VERY NOISY AND DO NOT FEEL BAD ABOUT B’N AS YOU HAVE RIGHTS AND EVEN MORE THAN THE BUFFOONS AND THEIR “PROFITS”. SERIOUSLY, I DO NOT KNOW WHO THESE IDIOTS THINK THEY ARE. BASH ‘EM FOLKS, THEY ARE HURTING YOU AND YOURS. there is a documentary out called appropriately “STINK” it is on you guessed it scents. another thing I did not have these sensitivities prior to becoming organic. greg’s and others reply to this is “you were so toxified before that you could not discern the danger near you”. It is not you or most likely you, who are sensitive (some of you may be) it is those around you who are DESENSITIZED from the load of their exposure to toxins. toxic load that is what it is called. pathetic…I do declare I did not see these days coming…I would have been an even more procoatious witch than I already was. RAISE HELL YOU ARE ENTITLED TO ALL THESE INDUSTRIES-THEY HAVE EARNED THE RIGHT TO BE DRAGGED THROUGH THE MUD, SUCH AS MONSANTO, FOR INSTANCE. I’ve suffered from chemical sensitivity for 30+ years. It’s been gradually getting worse and I’ve reached the point where I have to avoid the laundry soap aisle and 2 aisles on either side. My doctor told me I should use delivery service for my groceries which is fine and dandy except that only works for groceries. It doesn’t help with going out to a restaurant, movie theater, or anything else. It’s also not listed as a disability and should be. How about perfumes and colognes?! They’re not on your list!